Right in the middle of the “Gleisdreieck-Park” is one of Berlin’s craft breweries: BRLO. The building is constructed from shipping containers, giving it an industrial feel. The name “Brlo” is the old Slavic origin of the name Berlin and according to the founders it does not matter how you pronounce it, most importantly you should enjoy their beer! Besides having 20 of their own and other craft beers on tap, there is a restaurant specialized on fresh, local produce, so I have certainly never left there hungry. If you cannot decide which beer to try first, I recommend ordering the tasting board. This consists of 5 small glasses and should give you an idea what to order next! When I am there, I usually go for a “Berliner Weisse”, a sour beer typical for this region, with a dash of homemade fruit syrup. 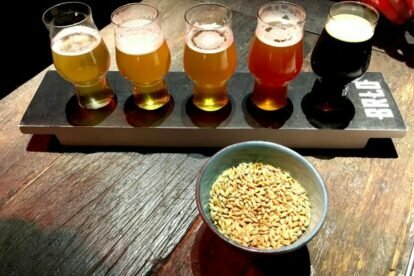 – They brew their beer on-site and there is always something new to try. – In the summer they additionally have a beer garden facing towards the park, which is a little more relaxed, or go inside to have a proper meal. For an idea how the food looks like there, check out my Instagram here. – It is located right next to the u-bahn station “Gleisdreieck”, making it easily accessible from most of Berlin.